I'll admit that this is not the news I had hoped for from WISE. Is it possible that WISE could miss a Dark Star not once, but twice? Even given the very short time periods when WISE was scanning the star-fields, the statistical likelihood of a double miss seems, on the face of it, low. Unless, of course, the data somewhere along the line has been suppressed. There are precedents in modern times when returning raw data was filtered through contractors first, e.g. Malin Space Science Systems, before being crunched by scientists. Given how reliant modern astronomy is on advanced computers, there is also scope for significant government intrusion - in exactly the same way that possibly all electronic communication is now routinely monitored by intelligence agencies like GCHQ and NSA. And these organisations employ very smart technically-minded people, who are certainly capable of delving through cutting-edge astrophysical data. One can take nothing for granted in our modern hyper-connected era. I've explored these possibilities in my fictional work, but it would be a very tough thing to prove in reality. Despite these, and other caveats, many scientists will naturally conclude that, even if such an object shaped the formation of the solar system in the past, it is no longer out there now. 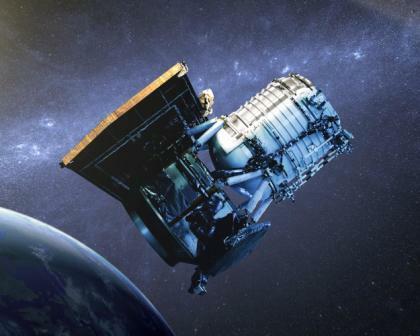 But possibly not all scientists: Brown dwarf hunter Kevin Luhman thinks that the search is definitely still on - that the vastness of the solar system may yet provide us with the elusive companion object (2). As one of the leading academics trawling through the WISE data, he is in a good position to know! * Since this was written, a major new development has taken place pointing towards a 10-Earth-mass Planet X object located at about 250 AU. I discuss this at length in my April blog. 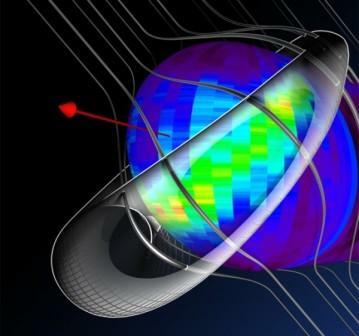 Scientists working on the forces shaping the edge of the solar system (at the boundary known as the Heliosphere) have concluded that there is indeed a tangible 'ribbon' of interaction between the solar boundary and external, interstellar magnetic field. This mysterious "ribbon" of energy and particles at the edge of our solar system appears to be a roadmap across the Heliopause boundary indicating the direction of the local interstellar magnetic field. These fluctuations in what one would otherwise imagine would be a uniform field effect, have led NASA to dream up the concept of 'interstellar fluff'. I have wondered in the past whether these local effects might be the fingerprints of something more substantial - a distant object interacting with our Heliosheath through its own intense magnetic field. Given the disparity between the data from IBEX and Voyager, I remain open to that possibility. Following discussion of ancient stone structures in Russia in last month's blog, the Internet has been buzzing about a new, rather sensational archaeological find in southern Siberia near the mountains of Gornaya Shoria (1). Two names associated with the find, researcher Valery Uvarov and the expedition leader Georgy Sidorov, are both heavily involved in the alternative knowledge field and I, for one, have previously encountered material promulgated by Mr Uvarov which I have found rather too wild for my tastes. But, that is not to say that there may not be any truth to this story. 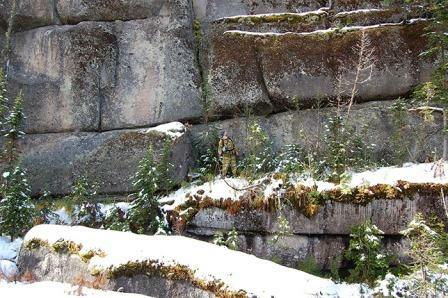 The images that originate from Valery Uvarov's site seem genuine enough, showing as they do walls seemingly constructed by truly enormous megalithic stones - perhaps weighing as much as 4000 tonnes each (2). Some commentators have opined that these might turn out to be natural formations, however much they seem to resemble other, smaller scale (!) megalithic sites around the world - although the conditions that might have caused these kinds of geological formations (common earthquake events, for instance) are not prevalent in this region (3). Valery Uvarov indicates on his website that he plans a further expedition to the region in 2014, and speculates that the structure might have succumbed in the past to a "colossal power explosion" (2). Let's hope he takes a professional surveyor and a qualified geologist along with him this time. A plane that disappears in this day and age of constant global communication presents a great mystery. Given the lack of a 'May Day' communication from the plane (and today they're saying the plane confirmed everything was all right just minutes before it disappeared), it would appear that there are two possibilities. Firstly, that the plane was instantaneously destroyed - to such an extent that the wreckage is too small and dispersed to have been recoverable. Secondly, that control of the aircraft was taken over, preventing all communications (e.g. a very well planned and executed hijacking). Since no groups have claimed responsibility for a terrorist act - or some kind of hijacking which subsequently led to disaster once the plane had been substantially diverted from its scheduled path - then the instant destruction possibility needs to come from either a natural catastrophic event, or something 'out of left field'. A natural event would be a statistically almost impossibly unlikely collision with a meteor. There are hints from the scant evidence emerging that an unidentified object was picked up on military radar to the west of Malaysia, and that a fiery object was seen in the sky by an observer. But an impactor from space must be a very remote possibility. The 'out of left field' zone might include an accidentally launched missile from a warship undergoing manoeuvres (which no country or military in their right mind would admit to). Controversially, question marks still remain as to whether the TWA 800 flight was brought down by a ground-to-air missile. Or could there have been a collision with something else in the sky that simply shouldn't be there? Like that unidentified object to the west? One of the things that many Ufologists have pointed out down the years is how many times unidentified physical objects have had dangerous near-misses with airliners which, at the time, scare the hell out of the pilots, but are then covered up with the usual harrumphing and ridicule. Perhaps the Malaysian airliner was not fortunate enough to get to that stage in the UFO-encounter process, ending in a collision with foreign technology that was truly catastrophic. Just my speculative thoughts, with the greatest of respect to the relatives of those lost who are desperately seeking the truth. With a rapidly changing story such as this, we might all know the truth soon enough. But, as things stand, the Malaysian authorities seem absolutely clueless. Author Erich von Däniken's new book provides many new photos of megalithic monuments, some obscure and others more celebrated. During his discussion he makes a short but, to my eyes, important diversion into a controversial translation of the Sumerian "Temple Hymns of Enheduanna", written about 2300BCE. He discusses translations by Dr Hermann Burgard, who "studied Sumerology for decades, who can read cuneiform writing in the original and who knows the ancient texts and their interpreters..." (1). After graduating with a degree in economics, he became a civil servant in the Commission of the European Economic Community (EEC) and had most recently held the rank of Ministerial Director functions as Head of International Monetary Affairs, Director for Structural Policy and Director of Innovation funding. In 1959 he received his doctorate in political science. He has extensive language skills in several modern and ancient languages. Fluent in French and English, largely Dutch; understanding of Italian, Spanish and Latin; some Ancient Greek. Since his retirement, Dr. Burgard studied Assyriology and Sumerology. From about 1998 specializing in the cuneiform texts of the king's daughter and twin High Priestess Encheduanna, the first author known by name in world history. I'm quite excited to hear of this independent work on Sumerian texts and its potential connection to ancient astronauts. Dr Burgard may not be an academic scholar of ancient Sumerian, but he is evidently a learned and intelligent man who enjoyed a high profile career in the European civil service, and has dedicated himself to these ancient linguistic and textural studies since his retirement. Hopefully, I'll be able to locate an English translation before long. Despite the upheavals in the early solar system, and the strength of the Sun's activity as a young star, the Earth appears to have cooled dramatically very early indeed. This early cooling also allowed water to form on the Earth's surface which led to the formation of life. New scientific work on some extremely old zircon crystals, obtained from a sheep ranch in Australia (1), date the crust to at least 4.4 billion years ago, just 160 million years after the formation of our solar system. Assuming this scientific evidence is correct (the work has some academic critics) then this leaves us with some questions to answer about the early solar system. 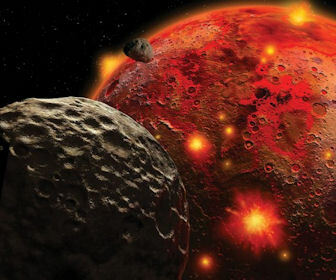 The Earth was struck very early on by a Mars-sized planet, inflicting a massive wound and resulting in the formation of the Moon. That must have happened before the date when these zircon crystals formed. 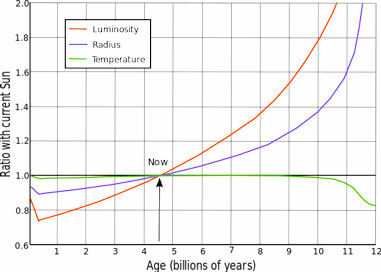 So, that earliest period of 160 million years in the Earth's life included the age of the molten magma oceans, a colossal planetary impact, then a fundamental temperature shift downwards whilst orbiting a stable star in a non-eccentric orbit. What's wrong with this picture? The Earth's position in the inner solar system is like being sat near the living room fire. Without the protective sheath of an atmosphere, the solar wind drives off volatiles, like water vapour, meaning that the early Earth should have struggled to hold onto its water - especially during a time when the planet was still raging hot. Given the short timeline for cooling, it's almost as if God threw a bucket of cold water over the Earth 4.3 billion years ago. I think this finding points to a totally different scenario - that the early Earth was located at a greater distance from the Sun, enabling it to cool far quicker. It then migrated inwards following a catastrophic encounter with a rogue planet 3.9 billion years ago (during the period known as the late, heavy bombardment). That way, it arrived in its current location as an already cooled planet covered with water and, potentially, teeming with life. I had the very great pleasure and privilege of organising a trip to the Houses of Parliament for a group of artists from Gloucestershire, and our families. Because of our interest in art, the local MP's office helpfully organised for us a special tour of the contemporary portraits in Portcullis House. Our guide was Parliament's own curator of art, Malcolm Hay, who provided for us a superb tour of the paintings of recent Prime Ministers and famous parliamentarians. He was charming, witty and highly knowledgeable - the perfect host. One of the things that seem obvious to all is that the subject of a painting portrait should sit for the portrait. Traditionally, this was always the case, of course. But since the advent of photography, the need for someone to actually sit before the artist and remain still for long hours has lessened. Some purist artists still paint from real life, many work exclusively from photographs, and the rest of the portrait artists do something in between. What strikes me when comparing old art with new is how much more detailed and technically accurate contemporary work is. 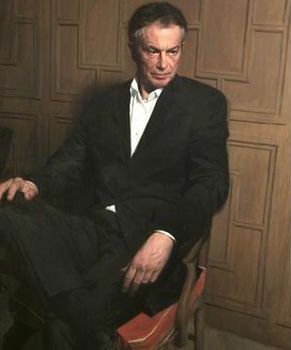 Almost to the point of perfection, in many cases of contemporary portraiture - known as hyperrealism. As a portrait artist who works from photographs myself, I find that I sometimes need to justify this to people who consider this an approach that is somehow 'cheating'. To my mind, I'm still creating art - consistently producing work that is immediately recognisable to anyone remotely acquainted with my painting style. But there remains an attitude towards this in artistic circles that means that the use of photographs in creating painting portraits is frowned upon. In reality, I suspect that in many cases the subject might 'sit' for a few preliminary sketches and, crucially, a series of good quality photos from which the portrait artist studiously fills out a detailed canvas over many, many hours. Looking at several of the wonderful portraits in Portcullis House, it was pretty self-evident to me that this was how things work. Politicians simply don't have the time available to sit for a hyperrealism piece. No chance. I loved the work on display at Portcullis House, which included many fine paintings which had been skilfully, meticulously created. The U.K.'s Taxpayers' Alliance, however, consider the collection to be an expensive vanity project during a time of government austerity (1). It seems to me that the price of portrait artwork bought with public funds could be cut significantly if the establishment could get over this pretence of commissioning an artist to create a 'live' portrait. The reality is that the live sitting, however important symbolically, is simply the starting point for the laborious technical work that follows.